RISE Credit: A Safe Short-Term Loan Option Or A Payday Wolf In Rocky’s Sweatshirt? Consumers looking for relief from the cycle of debt often associated with the use of payday loans may have seen the light at the end of the tunnel with RISE Credit. The products billed as the next generation in financial products has it all – a true American hero featured in its ads and the promise to give you a financial comeback. But if it looks like a duck, swims like a duck, and quacks like a duck then it’s probably a duck; or in this case just another predatory loan, according to consumer advocates. THE REAL DEAL OR JUST ANOTHER BAD DEAL? With a slick, professional marketing campaign featuring a famous sequence from Rocky II, RISE Credit came on the scene in fall 2013 promising consumers a customized installment loan with interest rates as low as 36%. The program even comes with a free credit report and the option of financial counseling for qualified borrowers. On the surface RISE Credit appears to present a viable option for consumers in need of short-term financial help. Depicting Rocky Balboa preparing for his comeback is enough to make any American hopeful, but if you look a little closer some experts say the product is just a payday wolf in Rocky’s sweatshirt. 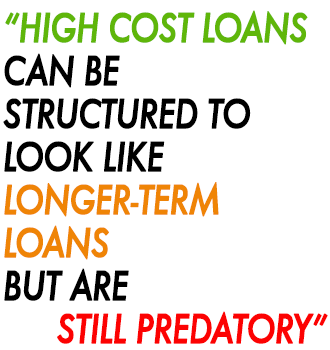 “High cost loans can be structured to look like longer-term loans but are still predatory, these are all predatory features found in payday loans, which makes these troubling in terms of consequences we know happen in payday loans,” said Diane Standaert, senior legal counsel for the Center for Responsible Lending. HELPING OR HURTING THOSE IN NEED? Typical short-term, high-risk payday loans have been known to leave consumers in a revolving door of debt by establishing three-digit annual percentage rates and tacking on exorbitant fees. But RISE markets itself as something different; a new kind of financial tool for those in need of emergency funds. Think Finance’s attempt to bridge the gap between payday loans and credit cards is commendable, but their product still raises red flags for consumer advocacy groups. Doherty said that RISE does not include any renewals only a principal pay down. “RISE’s principal pay down requirement is consistent with the Pew Research Center’s most recent recommendations for this industry,” she said. Unlike payday loans where consumers must repay or renew the loan in two weeks time, RISE allows consumers to pay off their loans over several months. When you look closer at RISE’s product you find that to receive a lower interest rate than typical payday loans a consumer must borrow more money. In South Dakota, for example, if a consumer wants to borrow the typical payday loan amount of $300 they would be required to make 13 payments of $50.89 bi-weekly. That adds up to an APR of 358% and a total payment of $661. In fact, to receive the lowest advertised rate of 71% a consumer would have to borrow $5,000 to be paid back over an 11-month period, resulting in a total payment of $9,300. To its credit, RISE does warn consumers that its loans are “an expensive form of credit”. Additionally, the product’s website features a “Know Before You Owe” section detailing that consumers are vulnerable to fees for late payments, returned payments, and/or a broker fee in Ohio and Texas, where it acts as a credit services organization and loans are made by a third-party lender. However, specific fee amounts are not listed. Borrowing online poses as a convenient option for consumers, but it comes with added dangers of financial debt. When consumers apply for small-dollar loans like RISE online, they are putting themselves into a precarious situation, said Suzanne Martindale, staff attorney with Consumers Union. Think Finance’s Doherty said RISE does not require access to consumers’ bank accounts. They can elect to pay by check or other payment methods. Still, the RISE Credit online application process prompts consumers for their banking information. Promises of convenience and quick-fixes are nothing new for Think Finance, the company behind RISE Credit. Think Finance is backed by Silicon Valley venture capital firms Sequoia Capital, Startup Capital Ventures, and Technology Crossover Ventures. Backers for Think Finance have not responded to Consumerist’s request for comment. Until 2001, Think Finance operated as ThinkCash and offered loans under PayDay One. Think Finance CEO Ken Rees formerly headed CashWorks, a provider of check-cashing products, and has been a longtime proponent of alternative banking options, including payday loans. It hasn’t been smooth sailing for Think Finance and its other lending services. Last summer, the company came under scrutiny for its part in using Native American tribes’ immunity from state and federal laws to evade customer protections. Think Finance operates Great Plains Lending and Plain Green Loans. The New York State Department of Financial Services issued a letter asking online lenders, including Great Plains, to cease and desist offering loans the violated New York usury laws. In December, Think Finance came under scrutiny for offering MySalaryLine, a small-dollar loan program pitched through consumers through their employers and payroll benefit providers. Curious why it would allow iconic image from Rocky II to be used for a questionable lending operation, Consumerist reached out to MGM’s footage licensing department, which controls the use of stills and clips from the movie. We have yet to hear a response.